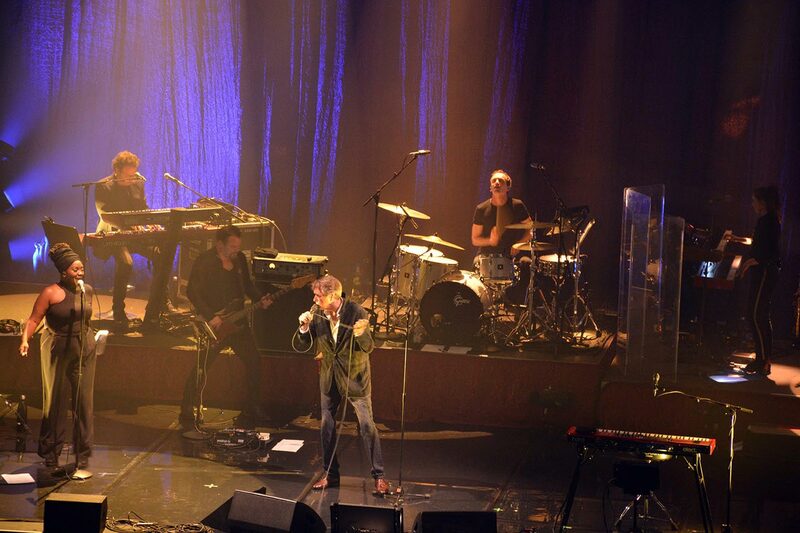 Bryan Ferry has a reputation as a very artistic performer who cares deeply about his music, constantly changing arrangements and songs. 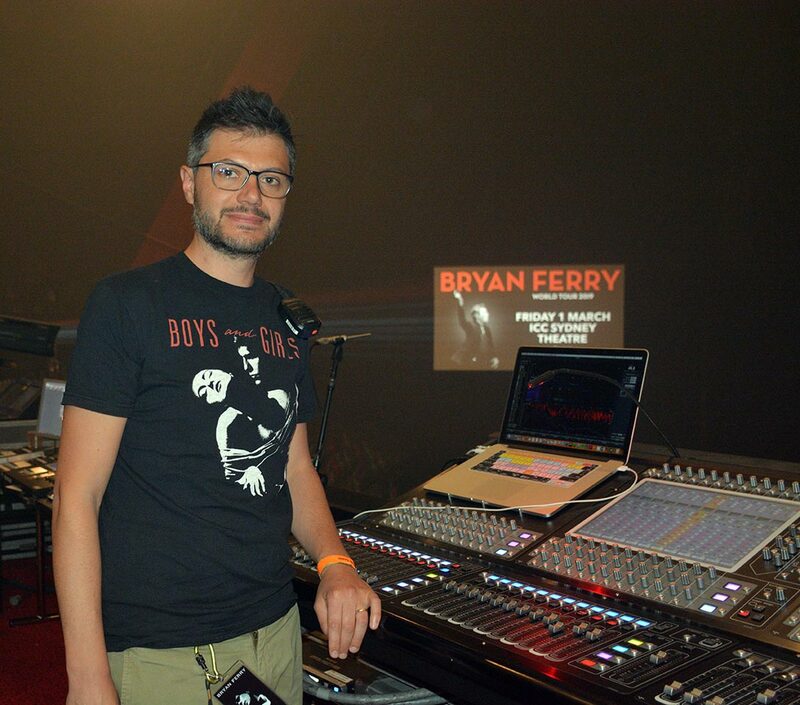 With an outstanding ear for the songs’ musical arrangements, both Bryan’s FOH and monitor mix require constant, active mixing throughout each song at a very detailed level. 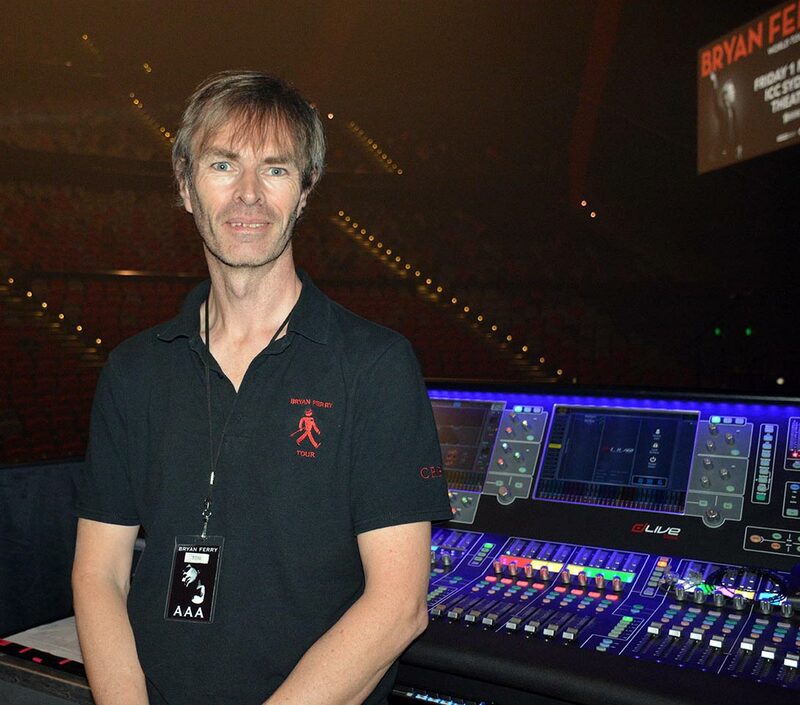 FOH engineer Davide Lombardi has worked with other iconic British singers such as Kate Bush, Ed Sheeran, Gary Barlow, Tom Jones and when the tour finishes, he hits the road with Dido who after 15 years has finally released another album. The tours utilized an L-Acoustics K1/K2 PA system with SB28s subs and a front face of ARCs and 108s, all controlled by Lake and LA network. 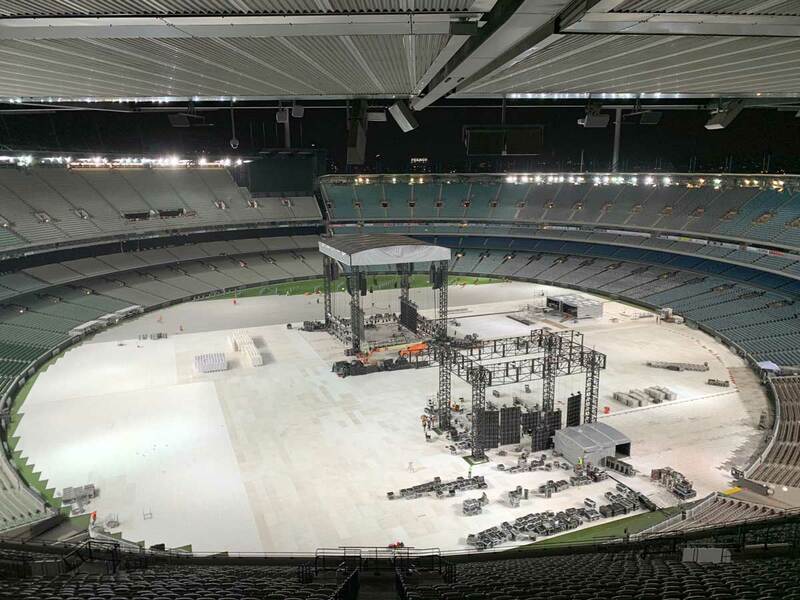 At the ICC in Sydney the set up was 12 K1s and four K2s on the main hangs with side hangs of 12 K2s, four subs flown, four ARCs per side as outfills, two ARCs per side as infill and 218s as front fills. Out front Davide was mixing on a DiGiCo SD10 saying the way he mixes is pretty simple with little in the way of routing. He doesn’t use plugins and the only external effect he had was a Bricasti M7 reverb, which he loves, and a tc electronic D2 delay unit especially used for the saxophone to recreate an 80s sound. An SPX 2000 is used for effect in just one moment of one song. Davide’s biggest challenge is getting Bryan’s vocal above everything else as he is a gentle singer and talker, and can sometimes mumble! As well as Bryan, there are eight people onstage and with his music being very busy, there is not much space left for his vocal to cut through. However Davide says that is something Bryan seeks as he wants to express himself with his music rather than his voice. The result is a lot going on for Davide with a ‘proper’ live mix. “There are constant changes and we can’t rest for one second,” he said. 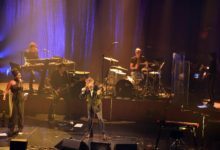 “There are layers and layers happening all the time.” Bryan uses an Audio Technica 6100 microphone, a dynamic mic that has condenser characteristics according to monitor engineer Tom Howat. Modeling amps are used for the guitars so there are no guitar amps onstage to help keep spill under control with Davide saying it sounds better. Sax mics are from SD Systems, again they are dynamic but have tripod prongs that clip onto the bell of the horn. Tom mixed monitors on an Allen and Heath dLive, his console of choice but fessed up to having a history with it as he was part of the development team! 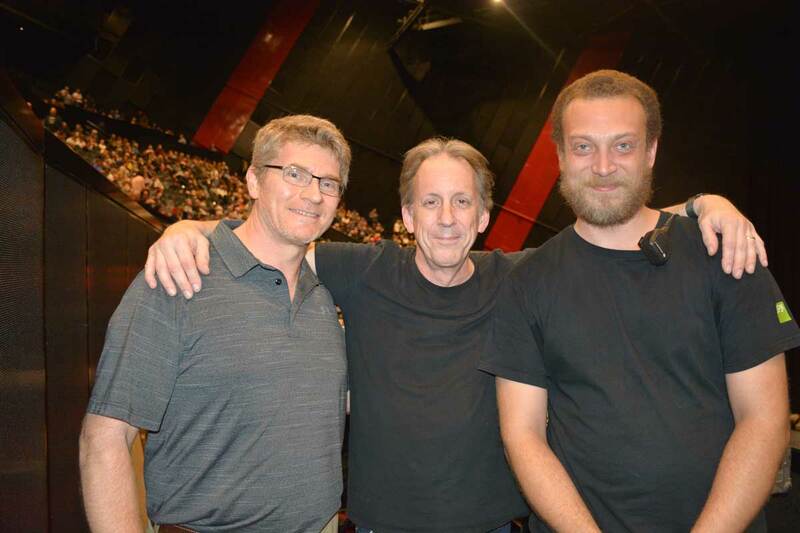 Everyone was on IEMS Sennheiser 2050s, with Tom having has 16 transmitters and only the drums were hard wired. Tom reveals that he has to watch Bryan closely taking cues from whatever he is looking at, maybe something has to go up or down depending upon the look on his face. Reading his body language is a key part of Tom’s job. Davide discovered that the ICC room had specific places that sounded quite different and he was interested to see how it changed once the audience were in the house. 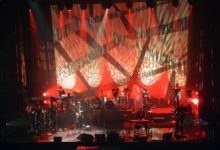 “The corridor by the FOH has a cancellation about the low end at 40 – 50 Hz so we’ve been measuring that with Smaart,” he said. “You can see when you move the microphone you see a big scoop coming on 50Hz. We’ve tried to fix it but you can’t, it’s a natural thing but hopefully it will be better when the audience are in. 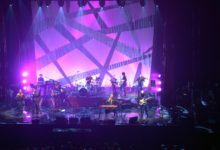 The music comes at them at such a complicated level it pays off to keep the technical elements as simple as possible whilst using the power of technology to simplify the process. 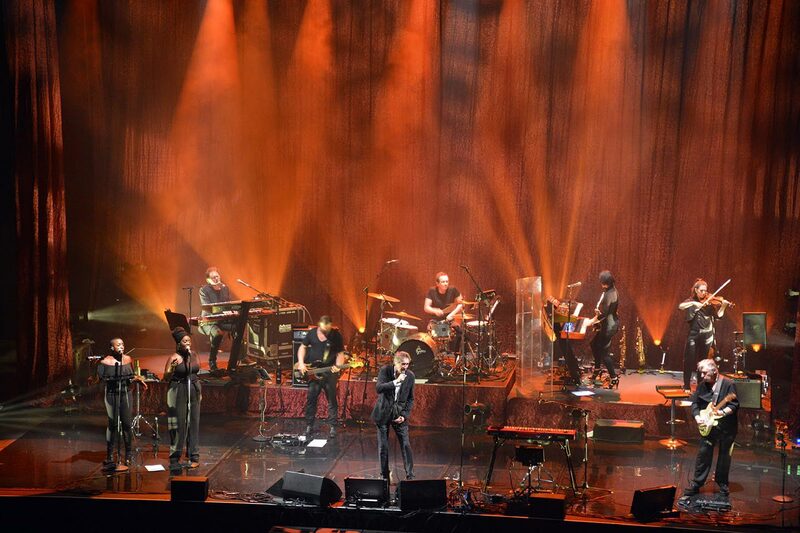 JPJ Audio supplied the gear and crew with Davide and Tom commenting on how well they work together as a team. 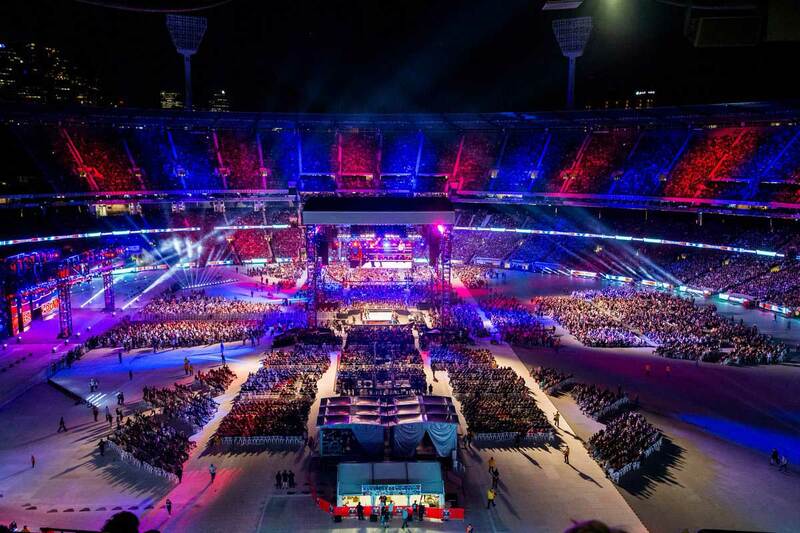 WWE, in partnership with TEG Dainty, returned to Australia with WWE Super Show-Down, an historic event that took place at the Melbourne Cricket Ground (MCG) and featured the largest collection of WWE Superstars and Legends ever to appear in the country. JPJ Audio provided the audio for this prestigious event including a Clair Global Cohesion 12 Line Array PA that was located in the centre of the MCG firing outwards. 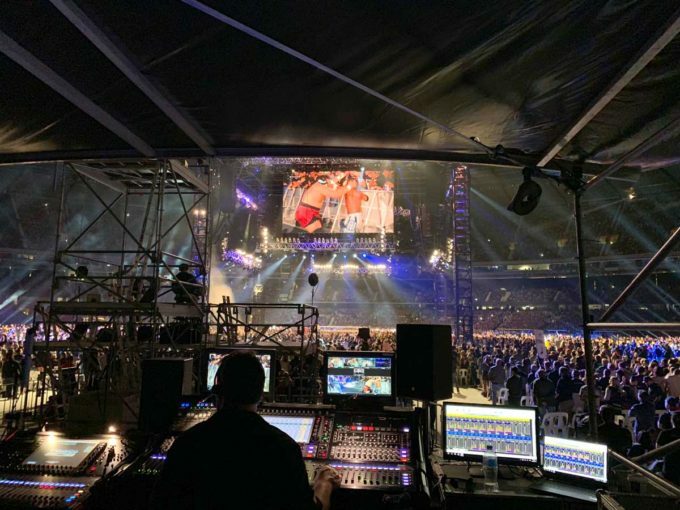 Also supplied were a flown monitor system inside the ring, all the RF requirements, consoles, patch equipment and of course, an excellent crew. For the FOH mix there was a DiGiCo SD10 along with a fully redundant SD9. Monitors also used an SD10, added in case there was a live band thrown in at the last minute. Our experience with WWE is you need to be prepared for last minute additions based on the direction of the live event, this set up allowed us to deal with any such situation. The entrance stage at southern end of the ground featured a ramp down to the ring for the wrestler and host entries. The stage and ramp housed monitors and wedges but no control gear as they were covered by the monitor system. A full, cutting edge Shure Axient RF system was positioned at front of house with wireless workbench monitored by the FOH engineer and JPJ RF tech monitoring the spectrum. Despite the MCG having significant challenges with multiple TV channels clashing in the middle of the stadium, it ran very smoothly. “The channel count was kept relatively low compared to what we were prepared for,” added Alex. 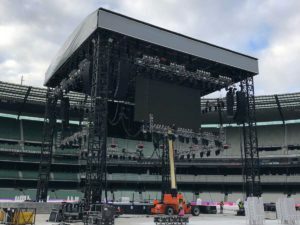 WWE’s Lance Vardis did FOH and Clair Global’s Daniel Laveglia executed all of the prep work in consultation with JPJ’s Mats Frankl to ensure a successful event. This was no mean feat as the event was nothing like a typical WWE arena setup. Despite being held in Melbourne, there was not a single drop of rain during the six days our gear and crew were exposed to the elements!